Valid Thursday - Saturday through 12/31/19. Thursday arrival requires a two night length of stay. This hotel features 248 suites with a private parlor room separated by French doors. 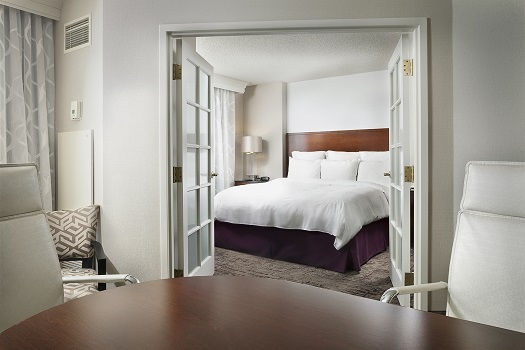 Suites include a spacious bedroom with a separate living area with sleeper sofa, wet bar, microwave, refrigerator, coffee maker, Plug-In Panel to connect your laptop, iPod and camera to the 32" LCD, HD flat-screen TV and in-room movies. Enjoy our state-of-the-art fitness center, outdoor pool, fitness trails, and area golf courses. Pets are welcome with deposit. Enjoy a delightful dining experience with friendly service, great food and an extensive menu at our restaurant, Parkway Grill which is open for breakfast, lunch and dinner, and offers room service. There are also 6 meeting rooms with 9,000 sq. ft. of flexible event space.